Whaaaaat? Another one of those “Facebook’s native app is faster” posts – No! You won’t hear this from me. After I had heard from posts/people that FB would be changing their core mobile architecture for their iOS app from more-or-less hybrid to native again, I had been waiting impatiently for the release. So there it was in the app store, as a big advocate for mobile web, I was almost afraid to launch the new FB native iOS app because I didn’t want it to be faster because I could not comprehend why a company like FB could not have engineers figure out this new HTML5 beast. Well, I launched the app. It loaded. Fast, faster than I thought, the scrolling wasn’t sluggish anymore. Native development succeeded? Not so fast my friend! I made sure I’d read the FB engineering blog post that explained the architecture behind the latest iOS app they built. To me that sounds pretty hybrid, no? – Nobody said hybrid is all webviews and no native components. So why the fuss? They identified the areas where pure HTML5 didn’t work quite well yet, either because of their backend/architecture was not setup to deal with mobile web/HTML5 parts due to maybe bloaded old JS or because certain elements should not be done via webview in general, e.g infinite scrolling that can’t perform well within an iOS webview. Here, Facebook’s engineering manager Dave Fetterman explained about a year ago FB’s approach to HTML5 and its challenges. There have been many people out there expressing their views on Facebook and HTML5. Here are some I liked and could agree with. I’ll take this opportunity to write about how Apple in order to maintain control over their app market are creating problems for HTML5. For instance they won’t let use run our web apps at full JS speed stating security issues, which everyone knows is BS. Don’t get me wrong I love Apple products, but practices like these really hurts the evolution of software. FB underestimated mobile web, hence they didn’t care much about mobile, and did not built their previous hybrid app accordingly with any potential growth of mobile web user base. They didn’t care about mobile that much because they didn’t know back then how to monetize it with ads. Of course, Facebook is huge and has so many smart engineers working there but they also have smart product managers, and we all know that FB is not making (much) money with their mobile products because they don’t include ads. I would argue that the focus on mobile has never been that big at Facebook to begin with and hence the apps & mobile web were always low-priority. They tried their best with their knowledge back then, now they share their problems and frustration: good for us to learn from their mistakes and make it better. Despite Zuckerberg admitting they made a mistake counting on HTML5, they will still continue to focus on mobile web because research says there are still more users accessing Facebook mobile web than Android and iOS together. HTML5 hybrid apps are not the solution for all businesses: Facebook’s infrastructure is unique and needs to handle thousand of requests constantly. Watch the velocity video (around minute one) for more details. It’s a challenge to handle loads like this, not only for mobile, but also desktop. Web Apis still need to catch up to deliver native-interaction properly, hence device specific features might still need to be developed natively. My suggestion for anybody thinking not to develop hybrid mobile web apps now, consider the following thoughts as they might convince you to shift your focus back to building hybrid/HTML5 apps. Don’t use bloated JS within your webviews: You don’t need to put all your logic on the client-side, server-side mobile (app) detection and enhancements can give you higher performance as well. Draw a comparison to Facebook, are you a dynamic content / social media company or a content-centric company like news broadcaster? Do you rely on complicated SQL queries or do you “just” show simple content results. How many people access your content and what kind of daily/hourly etc? What areas need to perform fast? If you need to load content on the fly, e.g. with infinite scrolling, think about moving such component to a native view, not everything has to be a webview! Be smart and honest about it. Evaluate each component of your hybrid app and follow the rule if the difference in terms of performance and user experience is way better with native code, use native code. I believe certain elements should be done natively, no doubt, navigation items behave less sluggish than mobile web implementations. However certain static/less dynamic areas with content could be served in a webview. Be aware of things HTML5/the browser can’t do or has problems with and try to fix them, e.g. the 300ms onlick delay. One thing you should always strive for is making your product better and faster, no matter what you choose to use, HTML5 or a native codebase. business 2.0 magazine calls it “social media” and i think it comes very close to a term that we could use by describing web 2.0 and its online community websites. not only did i get surprisingly informed about pandora.com (which unfortunately only works for US residents due to some legal issues), but also figured that there are more social radio stations like that: last.fm. business 2.0 magazine writes: “Last.fm, for instance, monitors all the tunes you listen to on your computer and adds a social-networking twist by sharing your playlist with other Last.fm users with similar tastes and vice versa”. read the “social media” article and find out who and what the “next net 25” are. yesterday’s article in the well-known german newspaper “Frankfurter Allgemeine Zeitung” (FAZ) talks about the power bloggers nowadays have to judge about products and brands and thus can influence a market with their opinions. Not only YouTube has been used lately to inform people about bad products, bad customer service, also blogs can make a company’s profile look horrible. YouTube videos show frustrated customers talking about products that just don’t work …within a few hours, a product can be (verbally) distroyed. the social computing is a powerful tool to inform about products, and blogs more and more help people to choose the right and not the wrong product/service. 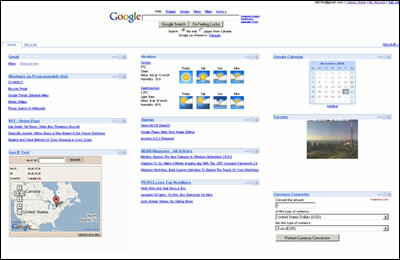 another google entry here, but this one is a really fun one: google gadgets can be used and integrated in your personalized google page: nice and wonderfully useful thing: i have been using the personalized google start page for a long time now, i have my calculator on it, my toronto webcam, some weather data, and so forth (see screenshot). but now, google announces to use these gadgets also for your own website, using a simple <script/> tag. do the math with google, huh? so, google is one of THE most powerful search engines in the world, google also just started offline advertising, it has a good stock market position, and now google can even slowly be used as a multi-functional information tool. while browsing the technology section of the new york times, i came across an interesting article about google shortcuts. did you know that you can use google as a calculator? well, try it out: type into the searchbox: 12+12, as a result, it will suggest the mathematical solution as a sum of 12 and 12.
did you know that you can search for a fedex package by typing in the fedex number: it will give you as the first result, it will give you a shortcut to the tracking information for your package. do you need a correct and fast definition of a word: well, then type it: define: [word] and it will give you all the definitions it finds on the web. and the the one that most of us have seen already before: when typing in an address, it normally shows as a first result the map of a city the address is related to. and this google cheat sheet is worth to be printed out and put next to your computer desk, it has the most useful search terms included. google can recognize certain codes typed in or numbers into the search box and eases your way to your result.